The fading dusk air flowed gently through the courtyard, carrying hints of jasmine and exotic spices from the closing markets. He inhaled deeply, breathing in the flavoursome scents mixed with her natural aroma, and it made his heart quake. Their hushed voices rising and falling in the excitement and sincerity of the moment where they kneeled obscured behind a wooden screen. Wrapping his hands around hers and revelling in the enveloped warmth, he watched in unrestrained adoration as the far reaching lanterns of the street filtered through becoming squares of illumination, dancing upon their close bodies. Moving his gaze to match hers he felt his nerves go weak and his heart beat with a most unusual force, instantly lost in those light golden eyes that bathed him with pure affection and happiness. "Why the Gods will not bless me with the knowledge to name such a being that truly rivals the beauty of the Mother herself I am humbly regretful" he whispered feverently. The barest crease of laughter around her eyes shone through the shadows as she held his hands tighter. "To interupt the Gods with such trivial matters of men one would think you entirely lovesick my dearest Emmer" she replied coyly, dark eyelashes hiding the mischevious glee as she looked down into her lap to suppress the bubbling joy eager to escape. "I am" he muttered breathlessly causing her to look back into his forlorn stare. He reached a hand towards the intricate veil of her head scarf, and she became keenly aware of his coarse fingertips grazing her neck as he lifted the light silk. Eyes wide with terror at his forbidden act she could not help but part her lips in anticipation when the cool air caressed her uncovered skin. The sun had retreated past the horizon leaving them intimately close, she could feel his heavy breathing hot beside her, while they waited in the deepening night. She took an unsteady breath realising she had been holding it since he had spoken. "The Mother named me-". His lips found hers causing her to gasp, in surprise or delight she could not tell as she was suddenly caught under the impact of his tender assault. Sensations errupted when she hesitantly responded, thankful for his strong hands that had risen to her shoulders as she felt her body weaken severely. Her mind surrendered to the infatuating emotions that undulated within, unable to control the nervousness and adrenalin where she fell into his embrace. Immersed in his passion her hands tentatively sought his firm chest. The tranquil darkness abruptly vanished as she forced her eyes open to confront the intense light cast upon them; their sanctuary had been compromised. She called out in distress, pleading for his life and fell to her hands as he was torn away, renewed fear overwhelming her. The looks of disgust and anger at her disgrace emanated form the soldiers that had assailed them as they hauled Emmer from the courtyard, his efforts to resist in vain. 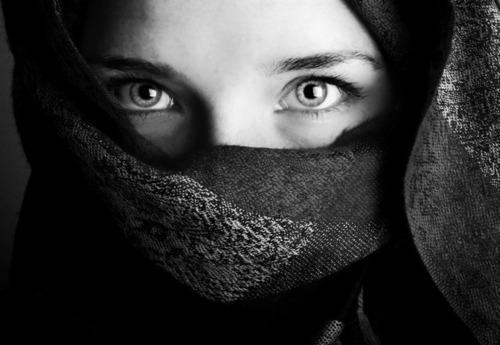 Spying the commander she threw herself at his mercy, unaware of the head scarf that had fallen free. "Roland I beg of you with the Warrior as witness do not harm him!" Desperation tainted her voice with sobs that threatened to close her throat as she struggled to adjust to the turn of events. Looking down at her with revulsion he seized a fistful of her dark unbound tresses bringing the frightful woman to her feet with a callous jerk. "You are not worthy of the title of the Gods and it abhors me to recognise you as a sister of mine" he spat. "You have committed sacrilige of the highest order with such profanity! You are nothing but an insolent whore!" A thought suggested itself and swelled with determination as he drew his scimitar in a moment of unchecked rage. "This is what the Warrior may bear witness to". With an unwavering sense of resolution he began to slash at her now tangled hair, cutting it to a savagely distorted crop. Tossing her into the arms of a soldier opposite, he marched off after the offender. Reeling from the intensity of her brothers venom she crumbled amidst the fallen strands of ebony, clutching her trampled veil uselessly, uncaring of the tears that wet her cheeks. You had me biting my lip while reading, you write with such raw emotion and it really pierces your heart! Gut-wrenching! O MY. More than 100 words, sure, but this is such a powerful piece of fiction! I was totally hooked and carried straight to the end. Gorgeous interweaving of emotions, customs, the locale - and without any overt telling. Lovely work! Wow that is an intense piece of writing. I almost want to go hug the poor girl. Wow indeed. That was incredible, transporting, and heart-wrenchingly raw. Just fabulous with imagery and emotion. I hope you'll be back next week. Can't wait to read your words. PS Let me know if you're on Twitter --- would love to add you to my list, so I can tweet people over to your blog to read your entry!